Dependable coverage, outstanding serviceoutstanding service, and decent rates are what we provide with your auto insurance. Our auto coverage will take care of you if your car is damaged or stolen, and provide liability coverage in an accident. That's what we offer. And in some places, you can extend this peace of mind with coverage options. Claims Hotline - Call us on our claims hotline at any time to report a claim, check on its status, or just ask us a question. Package Policy - By combining your homeowners or renters or condo coverages, your auto insurance, and your personal liability coverage all into one policy, you can get additional protection through higher limits than with separate policies. And best of all, one package policy costs less than separate policies. And while you're thinking about it: don't forget your valuable items such as jewelry, coin and stamp collections and some coverage for your boat. 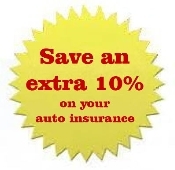 Depending on your auto insurance policy, one or more of these discounts may be available to you.